AceShowbiz –Miley Cyrus bid over $100,000 (£77,800) to spend the day with her own godmother, Dolly Parton, as part of a MusiCares charity auction over the weekend. The singer teamed up with Dolly as part of a tribute to the country icon at the Person of the Year gala, and again at the Grammy Awards on Sunday night, February 10, and now she’s making plans to hang out with the “Jolene” singer after helping to raise a fortune for the MusiCares charity. The “Wrecking Ball” star’s auction item comes with a costume, which Miley can’t wait to try on. “There’s a Dolly costume… She said I can pick whichever one I want and she never gives away an outfit,” Cyrus beams. 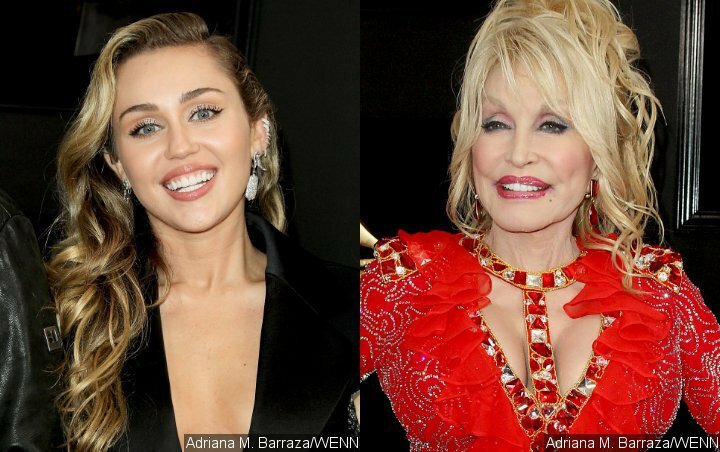 At the Grammys, Miley teamed up with her godmother for two numbers, Jolene and a cover of Neil Young‘s “After The Gold Rush”, which Dolly originally recorded with Emmylou Harris and Linda Ronstadt in the mid-1990s. Miley also returned to the stage for a rousing rendition of “9 to 5” with the country legend, Kacey Musgraves, Little Big Town, Maren Morris and Katy Perry.